We finally did it! 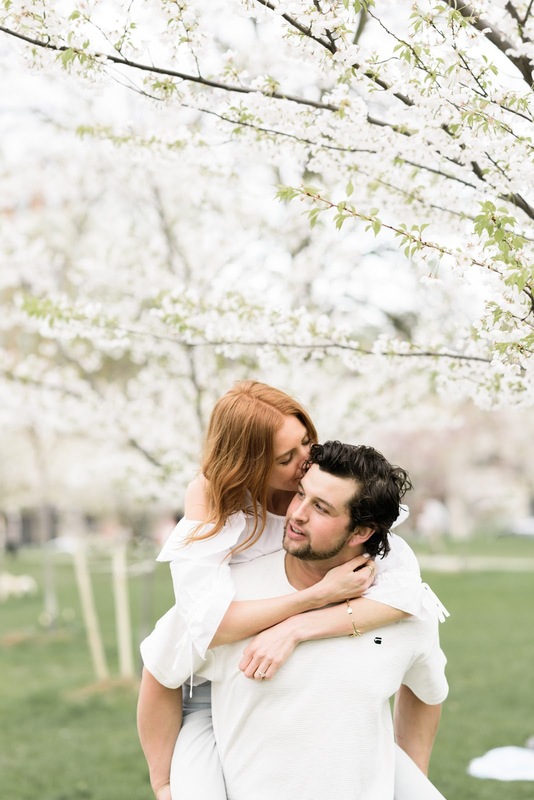 We had our engagement shoot. This is part two of our shoot. Our look before THE LOOK. We decided to do two looks so we could get comfortable with Alix first and just have some fun walking around town! I love some of these shots and how playful they are! So casual... sipping an espresso, jumping on B. It's pretty much the daily routine! Haha.. But now... for some serious insight on being engaged for the past 7 months. 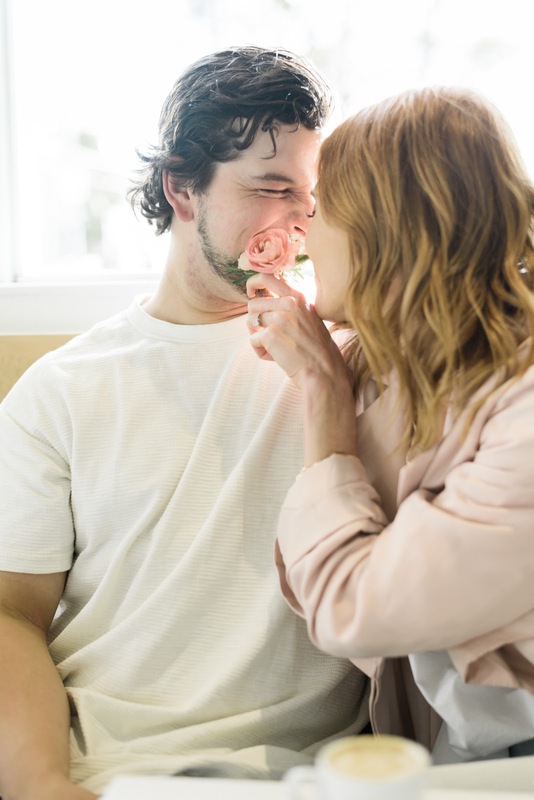 Let's get into my top tips for being engaged! "Oh my gosh! Congratulations! I'm so happy for you... now when's the big day?!" Um. Sorry? What... I literally got engaged five seconds ago. That is pretty much how every conversation went down the months after we got engaged. Brandon proposed to me on vacation and from the moment we got home that's all we heard! Are you people serious?! All we wanted to do was enjoy being engaged and not rush into picking a date. It's such a special feeling. Even if you have been together for so long. It just feels different when you're engaged! You want to enjoy all the little moments that come along with this time. And most importantly remember it all! So to help you out, I'm sharing a few ways we have been making the most out of this special time! 1) Take in every moment. 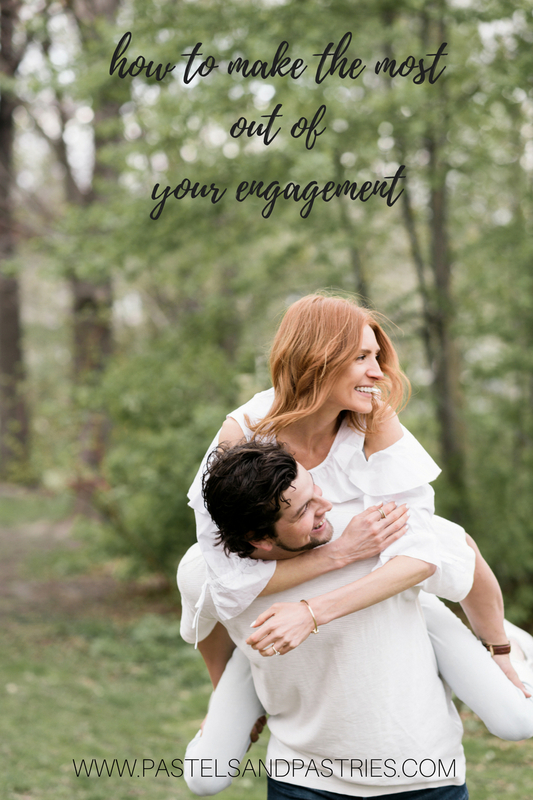 Being engaged is not a countdown or timeline. It is a period of time. Why rush this? Just take the time to bask in each other's love and embrace. 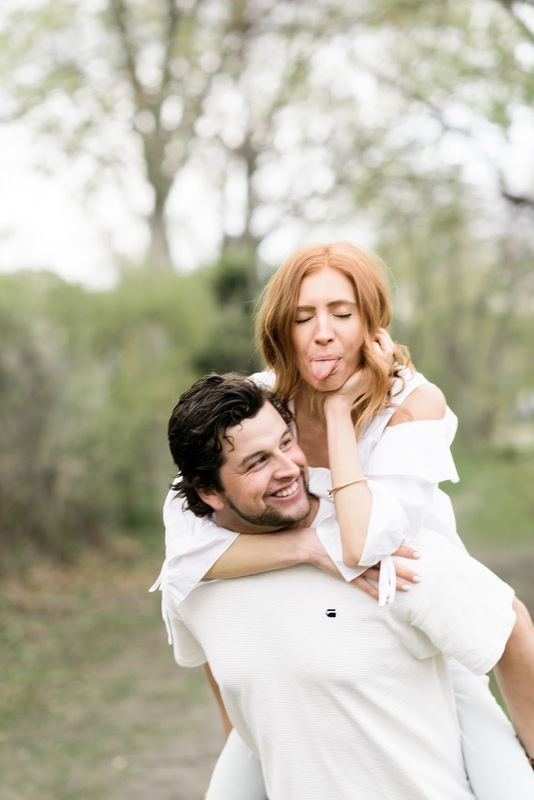 Get giddy and enjoy calling each other fiance for a while! It has such a nice ring to it, doesn't it? Take pictures, all the cheesy ones! Yes, with your hands in the air. And you best wave them around like you just don't care! We did it all! Hand up, holding the champagne glass, hand holding our lock on the love lock bridge in Paris. You will want to remember these little moments! When the wedding ball gets rolling, it will get rolling, and fast! Remember to slow down and make time stand still, even if just for a little bit. Family, friends, colleagues, they all want to know-- when's the big day? You do not need to get caught up in all the wedding talk. You will set a date that works for you both and it will be magical. We got engaged in October and in January we finally picked a date and a venue! At times it was hard to admit that we didn't know when it would happen or hadn't started planning. But that's okay! We were just loving being engaged. Believe me, once you start planning it will feel like you've jumped on a high-speed train to the chapel so there is no need to get bogged down that nothing is in place yet. You will get there and you will get there fast once it starts. 3) Decide on a timeframe. Okay, so I know I said to enjoy just being engaged and forget about the timeline, but there are a few things to keep in mind. Deciding on just a year, or month will make it all less stressful! Most importantly, make the date realistic. What year are you thinking? What month? This will have a big impact on when you need to start venue searching. 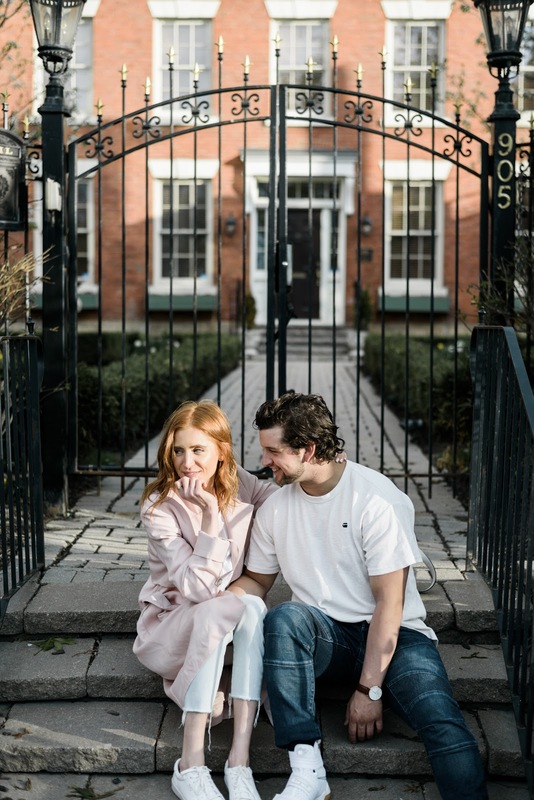 We got engaged in October and knew we wanted to set a date for summer 2019, that way we would have ample time to plan. This timing also gave us a grace period where I didn't feel crazy anxious about not planning. I knew that once January came along the hunt would begin, which would give us around a year and a half to plan. Plenty of time in my eyes! Even as we were venue searching now, many places were still taking bookings for summer 2018. So I knew we were in the clear. Remember you can't pick a date without having a venue so don't get your heart set on a date as it may not be available for your ideal venue. The two go hand in hand (just like yours and your lovers... cheesy? I know!). Here is where my eyes get real big, and a sly smile appears on my face. Ah, the Pinterest boards, the magazines, the wedding shows-- they can be so exciting! I would be lying if I said I didn't already have a wedding board on Pinterest before we got engaged, but this is the time when I started sectioning them out into venue looks, design elements, and decor. Just start collecting images that inspire you! Start compiling inspiring images and you will see a common theme starting to develop. I show them to B and it makes it so easy to see what he likes and doesn't. When I can't explain a design properly I can show him, and his reaction is a dead giveaway to see if he likes the idea or not. This part is fun and allows you to dream. What does your dream day look like? It can be out of reach-- even if just for a little while! 5) Stay true to yourself. Guys, sometimes the FOMO is real. We all get it. The magazines, the Instagram accounts... they can be a little bit overwhelming and unrealistic. Most of the weddings chosen on these accounts and in the magazines showcase extremely elaborate florals, cakes, and decor. Remember that what is do-able for someone may not be do-able for you. Even if it is unrealistic it can still fun to look at and gain inspiration from. Just remember why you are in this and that is to be married! To commit yourselves to one another. The day will come and go and no one will be as focused as you are on the design elements. Stay true to the big picture and focus on the things you really want. Does this help?! Let me know if you have any other suggestions. Do you have any wedding planning advice for me?! I'd LOVE to hear it! All photos were taken by Alix Gould Photography. So obsessed with all of these photos and you guys got sooooo many cute ones!! Can't wait to see what your wedding photos will look like. Slash these are great tips girly! Can't stop looking at these beautiful pics! !